Tom Coughlin had refused to call yesterday's contest against the Lions a "trap game." Detroit, after all, had proven through the first five weeks to be a pesky team, albeit one with just a single win to show for it. Still, you don't lose 23 consecutive road games because of bad bounces, and the Giants are lucky they weren't playing a better team yesterday. A better team would have probably beaten them. The Lions, though, did not. Not that the outcome was necessarily in serious doubt — Calvin Johnson's 87-yard touchdown in the fourth quarter gave the Giants their biggest scare, cutting the lead to just four — but victory wasn't assured until Antrel Rolle picked off Drew Stanton's pass with seven seconds remaining and the Lions down by eight. (The Giants would win 28-20.) This seems like a good place to mention that the Lions played much of this game with Stanton, their third-string quarterback, under center, after the Giants defense knocked yet another quarterback — Shaun Hill, himself starting in place of the injured Matt Stafford — out of the game. So these weren't even the loser Lions you're used to. These were the loser Lions using what's essentially their emergency quarterback. So perhaps it's best not to dwell too much on this one. In the standings, surviving at home against a weak team counts the same as going on the road — to Houston, for example — and dominating a good team. For what it's worth, Eli Manning recorded his highest passer rating of the season yesterday, completing 20 of 30 passes for 177 yards, but throwing two touchdowns with no interceptions. 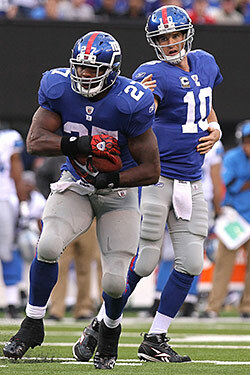 And Brandon Jacobs, once again a useful cog in the Giants' offense, scored twice himself. At 4-2, the Giants remain tied for first place in the NFC East, with one game left before their bye week: in Dallas, next Monday night, against a 1-4 Cowboys team.